The FIFA front office will be a bit emptier for a while as Sepp Blatter the president and some of his lieutenants were suspended. On Thursday, at the world headquarters of the world’s most popular sport a number of top officials at FIFA were given sanctions by the organization. The disciplinary section of the governing body of world football handed three of its top officials including its president provisional bans of 90 days. Michel Platini the President of UEFA is the head of the body that runs all of European football and the Champions League, which is the leading club competition in the world, received the provisional ban. At the same time, Jerome Valcke the secretary general was also banned 90 days. Platini was given an identical ban of 90 days from his role at UEFA as well. The former star from France is currently a candidate to succeed FIFA president Blatter, while another hopeful for the presidency Chung Mong-joon was banned for a period of six years and given a fine of $103,000. 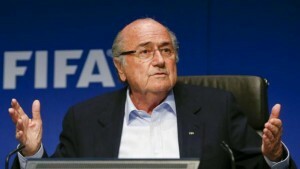 The bans arguably give both a big reputation problem in the race in FIFA to succeed the departing Blatter. The bans have left Issa Hayatour, the vice president at FIFA and the head of Confederation of African Football (CAF) a body that runs the soccer for all of the continent of Africa, in charge of the world soccer governing body. He was appointed as the acting president. Hayatour is a long-time administrator of soccer who has been the head of CAF since 1988 and has faced problems on his watch as well. In 2011, he received a sanction by the International Olympic Committee for taking payments in cash for a firm in sports marketing. Hayatour announced that he would serve only as the interim president and a new president will be chosen on February 26, 2016 by the Extraordinary Congress. He added that he would not be a candidate for president at that vote in February.